Saturday April 9th 1904 Will and I were here alone and the weather was very unpleasant with snow blowing most of the day and weather cold. I felt so badly that I only did what work I was obliged to. took medicine went to bed early. 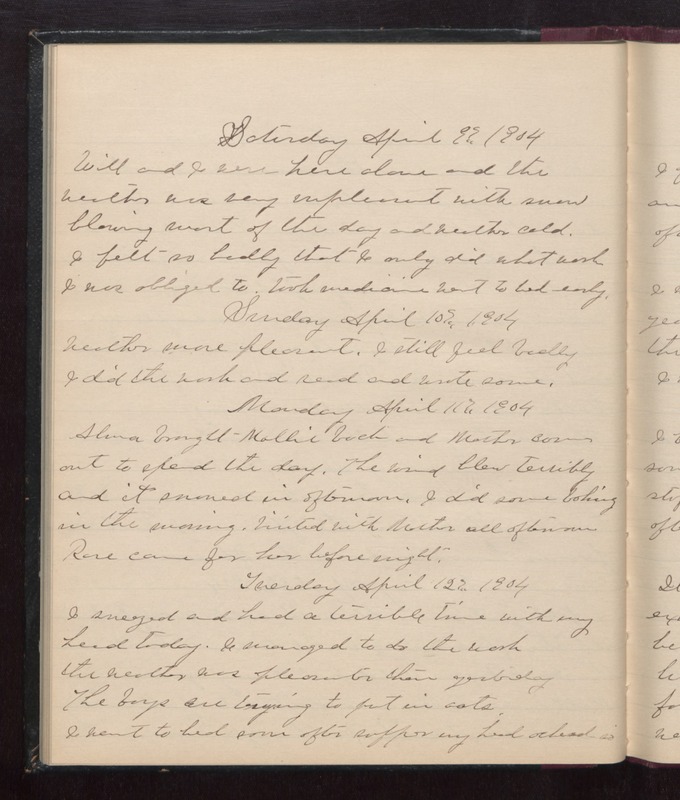 Sunday April 10th 1904 weather more pleasant. I still feel badly. I did the work and read and wrote some. Monday April 11th 1904 Alma brought Mollie back and Mother came out to spend the day. The wind blew terribly and it snowed in afternoon. I did some baking in the morning. Visited with Mother all afternoon. Rose came for her before night. Tuesday April 12th 1904 I sneezed and had a terrible time with my head today. I managed to do the work. the weather was pleasanter than yesterday. The boys are trying to put in oats. I went to bed soon after supper my head ached so.